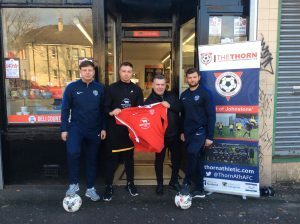 PAISLEY Butcher Graeme McGinlay has never been busier thanks to his new premises in Gallowhill – and his continued backing of Thorn Athletic Community Football Club. Graeme and son Scott, from Johnstone, have recently gone back to where it all began for the business more than 20 years ago after overhauling and re-opening disused premises. But although it’s a fresh start, they still have a firm commitment to supporting local clubs and organisations after entering into a FOURTH year of sponsorship with ‘The Thorn’. Graeme still has his busy shop in Well Street in the west end along with the The Butchers Deli & Bakery next door and with the new addition across town then things are bright. 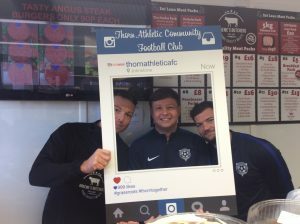 And Thorn Athletic secretary Mark McGee said: “We are delighted to see Graeme’s Butchers continue to grow and re-establish links with an area of the town they served so many years ago. “He is very loyal to us and that can be something that’s hard to find in today’s business community, particularly with all the challenges local producers face against the big supermarkets.